Clothing customization, for many years and still today, for many people, is pure fantasy. Unless you’re creating your own pieces from bulk fabric, thread, and a sewing machine (a dying hobby), which I suppose is the original ‘bespoke’, you’re buying off the rack. For my generation, which grew up with imported fashion purchased from the mall, the concept of ordering everyday clothing to your exact physical proportions is not just novel, it’s exotic. When you live in Italy, however, bespoke is more widely accessible, because the country is full of skilled seamstresses who through apprenticeship and years of experience, can whip up a custom dress shirt like Ina Garten whips up a mean meringue. 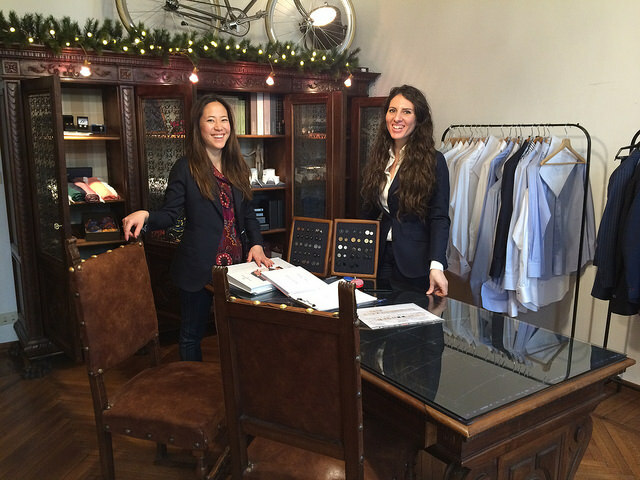 I discovered Eligo Milano Bespoke during the first months of school, and to my surprise, have forged an ongoing relationship with its owner Naomi Kohashi. We’ve mutually benefitted from partnerships and events at her business venue, sponsored by the club I manage, with business students who someday, will be her best customers. When I asked a friend I met early in the year at one of these events where he buys dress camicie, he said “duh! Eligo!” How could I overlook this obvious choice? I ordered three shirts from Eligo, which with a generous discount for being a friend, came out to ~€270. That’s €90 for a custom, 100% cotton button-down, with a monogram, for less than what many stores, even mid-range sartorial brands like Boggi Milano, charge for a workwear shirt. Other requests can probably be accommodated, since there isn’t really a standard setup—other than that all shirts have things like sleeves and buttons. Every product that comes through Eligo is made in Italy, which can’t be said for some of their local bespoke competitors, who outsource to places nearby like Romania, where labor is cheaper but less skilled. So far, I have only worn them a handful of times. Though they’re very slim (which is how I prefer dress shirts but can sometimes feel like sausage casing), they feel much more like a second skin than anything I’ve ever worn. They look great with a tie and jacket, or with jeans. The bespoke experience is one unique to Italy, and Eligo’s pricing is accessible to most if you consider it an investment in future years of wear. With proper care and minimal physical expansion or contraction, such shirts could last well into the future. Even then, a skilled tailor can adjust items. The only downside to ordering bespoke is the time commitment. An hour or less for each fitting, but somewhere between four and six weeks for a multi-shirt order. Nothing is turned around quickly, but few of the best experiences happen on short notice, especially ancient art forms like that of bespoke shirting and suiting in Italy. If you have the opportunity and the interest, and they do make women’s shirts as well, I recommend you arrange it with Naomi at Eligo Milano Bespoke. She will take care of you! near luxury brands, which is your favorite?